This 3" Aluminum centrifugal waterpump has NPT threads and is capable of delivering 264 Gallons Per Minute at 37 psi. 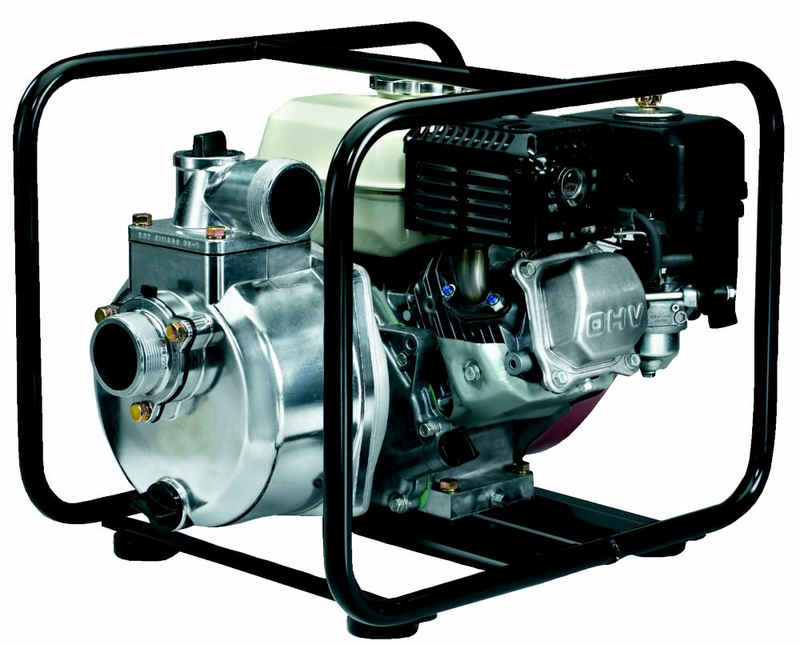 It comes with a 25mm powder coated steel frame and a 3.1L steel fuel tank on a GX200 Honda Engine. MOUNTED WITH A PRESSURE REGULATOR Inch FLUOMAC Inch #600600, THIS ELECTRONIC SYSTEM ELIMINATES THE CONVENTIONNAL TANK AND PRESSURE SWITCH TO START AND STOP THE PUMP. IT REGULATES AND CONTROLS THE DELIVERY OF WATER. UTILITY PUMP WITH HOSE AND PUDDLESCOOP.3/4 Inch NPT DISCHARGE FOR GARDEN HOSE. IDEAL FOR REMOVING WATER FROM FLAT AREA, DEWATERING AQUARIUMS, WATER BEDS,OR ANY OTHER APPLICATION. 115V MOTOR.CAPACITY: 450 GPH/5' 275 GPH/20' 75 GPH/40'. The 1/3HP pedestal sump pump manufactured of corrosive resistant thermoplastic materials will discharge up to 3,000 gallons per hour of water. It includes an adjustable vertical on/off switch. It is driven by an air cooled 115V motor. Centrifugal pump - Powered by Honda GX120 engine Koshin centrifugal pumps are designed with cast iron impellers and volutes for long operating life. Manufactured with low oil-sensing Honda engines and aluminum pump casing for light weight portability, they will provide optimal performance for all of your industrial dewatering needs, including manhole and vault draining, landscaping, irrigation, and other general construction applications.